It must be summer because I’m wanting to eat ice cream all day every day. 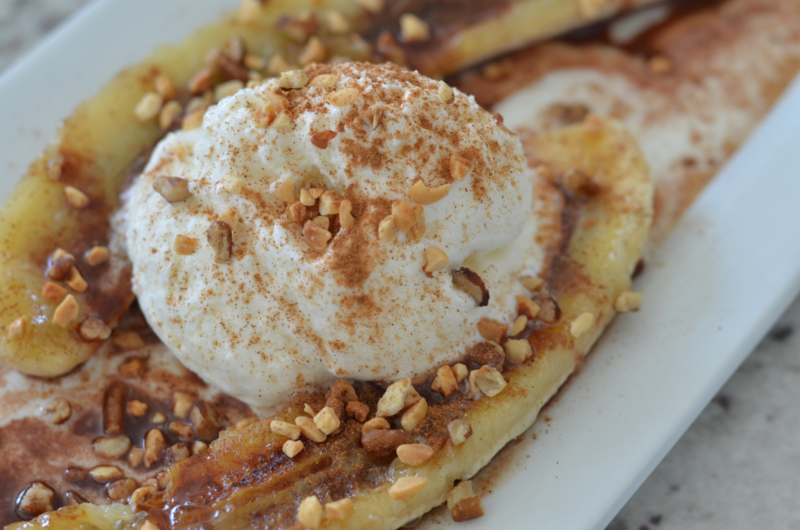 Who else could get a little excited about bananas and ice cream and still look amazing for swim suit season!? Thank heavens for Veggie Lisa, this girl is taking this banana themed treat to the lighter and better-for-you side by making some substitutions that will satisfy even the sweetest of sweet tooths? Sweet teeths? You know what I mean! Slice bananas in half; keep the peel on when grilling. Place bananas face down on grill for 3-4 minutes. Flip right side up and brush with melted honey. Allow peel side to cook for an additional 3-4 minutes. Remove from grill and take peel off. Place on serving dish. Top with cocoa sauce, coconut ice cream and some chopped peanuts. Mix the yogurt with the trivia in a medium bowl, add in extract to taste. Thin “ice cream” base out with either almond milk or water (should only take about 1/4 cup or so. you want the consistency to be that of a normal ice cream base). Allow to sit in fridge for at least an hour so that the stevia/sugar blend dissolves. Place in ice cream maker until soft set, about 20 minutes. Store any remaining leftovers in freezer. Using what ever method your heart desires, arrange this yummy goodness in anyway you see fit. Enjoy!